1.Tamil Nadu State Eligibility Test (TNSET 2017) Qualified. Register No. 28126113.
? University / Institution: Kongunadu Arts & Science College, Coimbatore, Tamil Nadu, INDIA.
? Period: 1st January, 2008 to 10th August 2011.
? University / Institution: Allagappa University, Karaikkudi, Tamil Nadu, INDIA.
? Class / Grade: II Class.
? Class/Grade: I Class with Distinction.
? University / Institution: Periyar University / PKR college of art & science for women, Gobi, Tamil Nadu, INDIA. 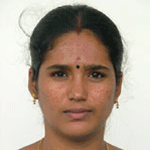 ANNA UNIVERSITY recognized supervisor (Ref. No. 2970111) for guiding Ph.D scholars under the faculty of Science and Humanities. BHARATHIAR UNIVERSITY recognized supervisor (Ref. No. MATGU2997) for guiding Ph.D scholars under the faculty of Mathematics.